During my first week in Japan, I made numerous trips on the Shinkansen bullet train, and found it to be a haven of peaceful serenity, with only the gentle hum of the engines breaking the silence as the countryside flashed by at more than two hundred kilometers per hour. As such, I was very worried about the poor unsuspecting Japanese unfortunate enough to land in the same reserved seat carriage as one hundred and seventeen gaijin. As it happened, however, our group was split into two, and those in our car were for the most part silent. I wasn't brave enough to venture into the next car, but I feel confident that it would have been, well, somewhat different to the norm! My seat was beside our charming local guide, who had a single group train ticket for us all. 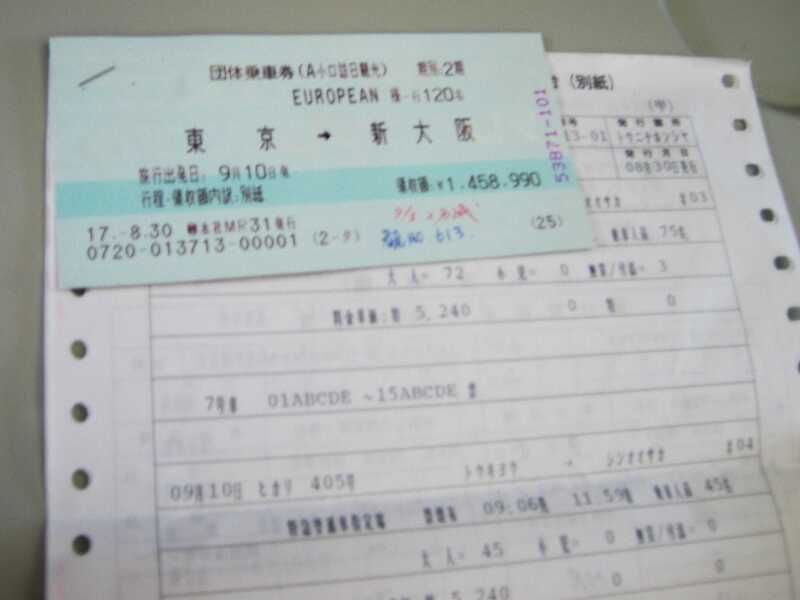 This is worthy of note largely due to its cost, a spectacular ¥1,458,990, or somewhere around the ten thousand euro mark. I asked if there was any discount for such a substantial purchase; it turned out that there was: some seven thousand yen, or about half of a percent of the total, had been generously knocked off the overall price. There is no doubt that the maintenance of the bullet train system costs money, but nevertheless it was quite a wake up call to discover how expensive individual tickets were; we had had completely unlimited use of the system for one week with our Japan Rail passes, which it seems paid for themselves with two tickets. Future travellers to this wonderful country should take note; JR Passes will save you a lot of money. The original tour schedule had us leaving Expoland at 5:00pm, which we'd understood to be closing time. Signs at the gate indicated the park was open much later, though, and after some discussion the proposal was made to push the leaving time back an hour. Two coaches were in agreement on this, but the third argued the point, and consequentially we ended up splitting the difference and leaving at 5:30pm. One might regard this whole paragraph as pointless, and it is, but I feel compelled to remark that people who don't want to spend time in parks probably shouldn't be on a coaster enthusiast trip. The departure time left me without enough time to do all the attractions I wanted to, just so that some people could get to their hotel room half an hour earlier. After yesterday's experience of technicoloritis in Nasu Highland it was a bit of a change to discover that the four major coasters in Expoland are painted a mixture of white and pink. This presented an even greater obstacle for budding photographers; as per usual I took a lot of pictures, and it was very challenging to sort out which pieces of track belonged to which coaster. 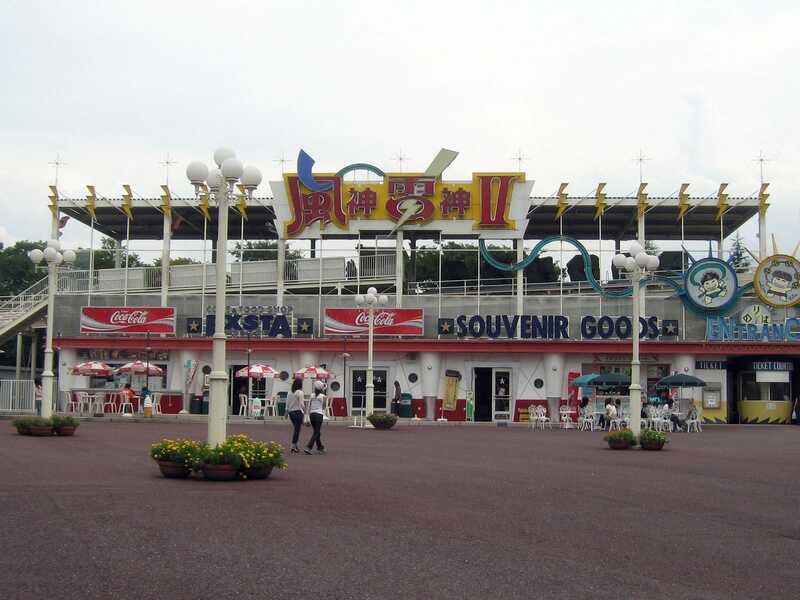 Our first stop was at Fujin Raijin II (#628), a TOGO stand-up coaster. From ground level the layout looked exciting, and after our experience on its little brother last week I anticipated a fairly decent ride. However, it wasn't to be; the train proved to be completely incapable of negotiating the rails without shuffling violently, and the overhead restraints meant that every single impact was transferred with unerring accuracy to my head. The standard of tracking was sufficiently bad that I remember remarking that the ride seemed like an accident waiting to happen. Two years after our visit an axle failure resulted the death of a passenger. The subsequent investigation led to the permanent closure of the park. Mini Coaster (#629) seemed like a good way to recover from the previous nightmare, and despite being incredibly noisy for its size it rode pretty well. It featured a rather unusual tire drive lift hill; the wheels were placed on the side rather than the top as would be normal for western-built rides. The mechanism was clearly struggling to move the train properly, with some very jerky motion and some slipping, but we were able to score our credit in the end. Curiously there was no anti-rollback device on the lift hill, indicating that this was only ever going to be a one train ride. The signature attraction in the park is Daidarasaurus (#630), a jet coaster that is currently the longest operational coaster anywhere in the world. 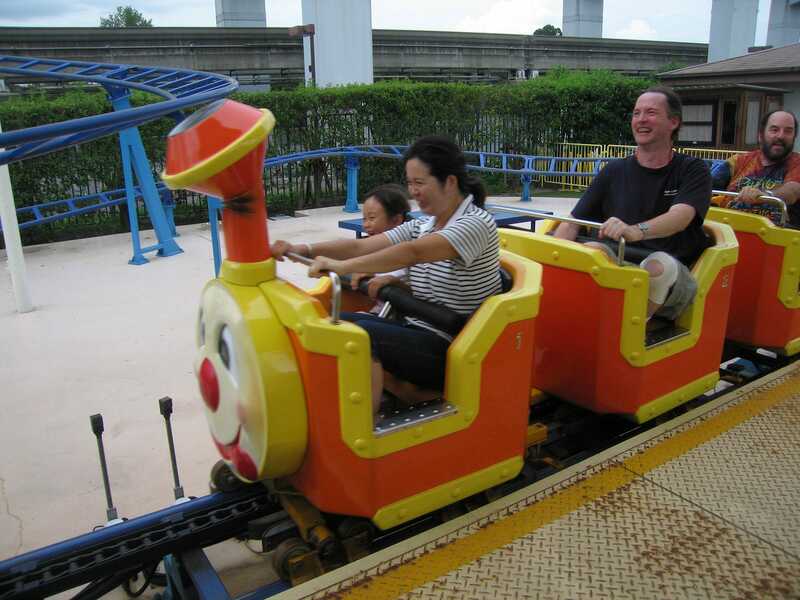 The ride was constructed with two parallel tracks that the park subsequently connected, and thus riders are taken on a slow tour of the park not once but twice using the traditional dull gently sloping hills. The experience is definitely not that of a thrill ride, but despite that it was good fun, and the view of the rest of the park was impossible to beat. The only black mark for me was the noise produced by the steel wheels running on steel rail; passengers could hear nothing else. Nige remarked that it was truly a sad state of affairs when an Arrow Corkscrew was one of the best coasters in the park, and while I don't agree with his assessment there was no doubt that Space Salamander (#631) was remarkably smooth in comparison to what I have come to expect from older generation Arrow rides. From there we went to Orochi (#632), a clone of Raptor without the mid-course block brake. The first half was as expected, but the second half was in a league of its own, being exceptionally intense while remaining smooth. I'd happily have gone back for more rides given more time. Wild Mouse (#633) and Family Coaster (#634) were the last two credits of the day. The latter was a particularly amusing experience due to two corpulent americans who could not get the lap bars to close due to the sheer volume of blubber hanging in front of them. They really wanted to ride, and on their request Martin (who is not insubstantial himself) pushed the lap bars as hard as he could, closing them enough so that the ride could be run. The operator seemed to find this even funnier than we did, though it could not possibly have been comfortable for the people involved. With only limited time left in the park I decided to spend the last hour on my own. The Big Ghost House dark ride operated with a transport system that could not have been less than thirty years old. It did feature one scene which made me jump, though otherwise it was missable. The Mystery Adventure was a Senyo Cosmo Cruiser ride along the lines of the somewhat underwhelming Garaxy Grand Prix at Greenland. It seems that these rides are popular in Japan, though it is not hard to see why they have never sold abroad. The Shooting Ride was a Senyo attraction with the easy-to-hit targets seem previously at Lagunasia. Finally, the Ice World was similar to that at Uminonakamichi, albeit for the fact that it was almost completely frozen over, making it impossible to see the stuffed animals and the like within. It probably needed a full defrost before being chilled back to -30° again.